**If your package arrives damage please contact the courier within 48 hours to report the damage. 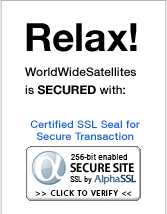 Most products sold by WorldWideSatellites have a limited time warranty. Below shows more information on the limited time warranty. manufacturers website for details. WorldWideSatellites Warranties the Conaxsat product line for 1 year. Some of the other free to air brands we can handle the warranty process with the manufacture on your behalf. contact our RMA department for more information. All Sales are Final, No Refunds!!! warranties the EMP LNB for 1 year. All Sales are Final, No Refunds!!! Switches have manufacturer warranty or no warranty. All Sales are Final, No Refunds!!! Motor brand Moteck SG2100 carries a 30 day exchange warranty .We only exchange for the same product. warranty. All Sales are Final, No Refunds!!! If your product qualifies for warranty please contact our RMA department. *All Returns MUST be authorized. Before shipping back contact our RMA department by clicking here. *** In the rare event we use our discretion to override our no refund policy there will be 20% restocking fee, no exceptions.